Crispy, succulent and dripping with tasty goodness, these roast pork belly dishes will have you salivating. For your guilty, mouth-watering pleasure, we've sourced a list of the finest pork belly dishes Sydney has to offer. Nothing says late-night snack quite like Mr Crackles. If braised pork belly served with cabbage salad and mayo between a soft white bun sounds like your idea of a good time, then Mr Crackles sweet pork roll is sure to satisfy. A definite Sydney pork belly must. If there was ever a time and a place to spend big on pork belly in Sydney, it's at Spice Temple. Guangxi-style, crispy roast pork belly with coriander, peanuts, red onion and sesame seeds—need we say more? Or how about stir-fried, twice-cooked pork belly with leeks and Sichuan black beans? 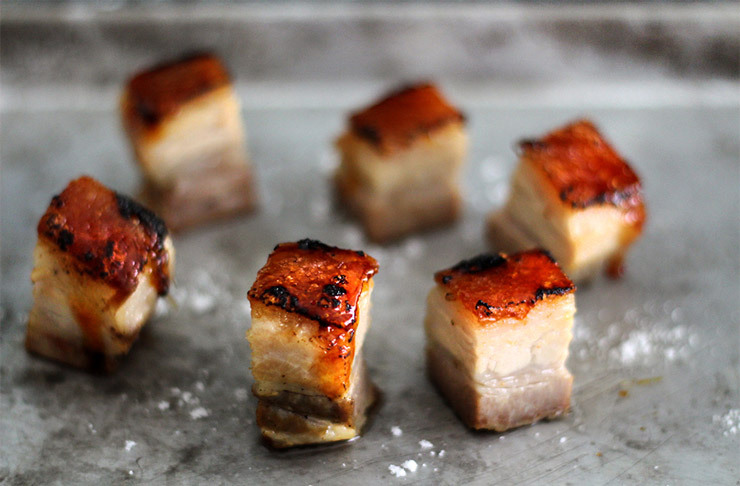 If that doesn't satisfy your pork belly desires than nothing will. This hearty Bavarian menu features an abundance of pork belly. Try the baby pork belly bites with crackling, spiced apple and baby beetroot. If you prefer your pork belly in a bun, opt for the sliders. Head down on a Sunday for the roast pork belly special. Do you like your pork belly with a side of harbour views? At Quay you can dine on a broth of smoked pork ribs with roasted rice and sesame, pork belly and shaved cuttlefish—it doesn't get much better than that for a Sydney pork belly indulgence! Get a group of ten diners, and with just 24-hours notice, Four in Hand will prepare a whole roast pork belly for your feasting pleasure. If you're after something a little less challenging, order the roast pork belly with cabbage salad and baked peach. In true Munich style Löwenbräu Keller serves up traditional Bavarian dishes, with customarily difficult to pronounce names. The Knuspriger Schweinebauch comprises crackling roast pork belly with beer sauce, sautéed potatoes and slowly braised red cabbage. The Schlachtplatte (or boiled pork belly) feeds two, and comes with an assortment of delicious sides. Spice I am offers an ultra authentic Thai dining experience. This multi-award winning Thai restaurant is renowned for its three specialty pork belly dishes, including: crispy pork belly with Chinese broccoli; basil crispy pork belly; or pad prik king crispy pork belly. Although you may have to hunt it down through Sydney's streets, the Tsuru Food Truck is well worth a visit. Famed for its delectable steam bun sandwiches, and more specifically their signature pork belly bun, it arrives slowly braised and topped with cucumber pickles—yum! Bodega offers a Latin-inspired tapas menu with an enticing grilled pork belly option. As the restaurant promises, you'll be sure to leave with a full tummy and a happy heart.